November 21, 2017 – The vault-like, 40-foot diameter, 40-ton door of Chamber A at NASA’s Johnson Space Center in Houston was unsealed on November 18, signaling the end of cryogenic testing for NASA’s James Webb Space Telescope. The historic chamber’s massive door opening brings to a close about 100 days of testing for Webb, a significant milestone in the telescope’s journey to the launch pad. The cryogenic vacuum test began when the chamber was sealed shut on July 10, 2017. Scientists and engineers at Johnson put Webb’s optical telescope and integrated science instrument module (OTIS) through a series of tests designed to ensure the telescope functioned as expected in an extremely cold, airless environment akin to that of space. These tests included an important alignment check of Webb’s 18 primary mirror segments, to make sure all of the gold-plated, hexagonal segments acted like a single, monolithic mirror. This was the first time the telescope’s optics and its instruments were tested together, though the instruments had previously undergone cryogenic testing in a smaller chamber at Goddard. Engineers from Harris Space and Intelligence Systems, headquartered in Melbourne, Florida, worked alongside NASA personnel for the test at Johnson. The Webb telescope team persisted with the testing even when Hurricane Harvey slammed into the coast of Texas on August 25 as a category 4 hurricane before stalling over eastern Texas and weakening to a tropical storm, where it dropped as much as 50 inches of rain in and around Houston. Many Webb telescope team members at Johnson endured the historic storm, working tirelessly through overnight shifts to make sure Webb’s cryogenic testing was not interrupted. In the wake of the storm, some Webb team members, including team members from Harris, volunteered their time to help clean up and repair homes around the city, and distribute food and water to those in need. Before cooling the chamber, engineers removed the air from it, which took about a week. On July 20, engineers began to bring the chamber, the telescope, and the telescope’s science instruments down to cryogenic temperatures — a process that took about 30 days. During cool down, Webb and its instruments transferred their heat to surrounding liquid nitrogen and cold gaseous helium shrouds in Chamber A. Webb remained at “cryo-stable” temperatures for about another 30 days, and on Sept. 27, the engineers began to warm the chamber back to ambient conditions (near room temperature), before pumping the air back into it and unsealing the door. In space, the telescope must be kept extremely cold, in order to be able to detect the infrared light from very faint, distant objects. Webb and its instruments have an operating temperature of about 40 Kelvin (or about minus 387 Fahrenheit / minus 233 Celsius). 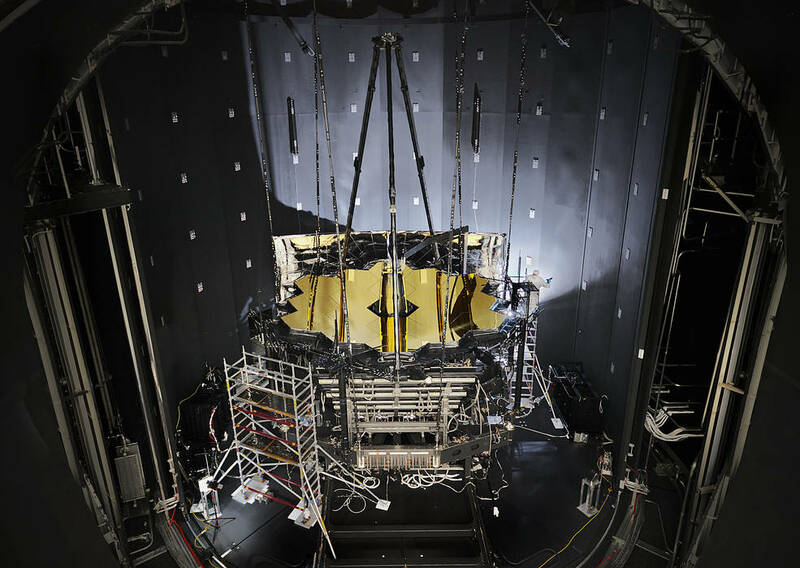 Because the Webb telescope’s mid-infrared instrument (MIRI) must be kept colder than the other research instruments, it relies on a cryocooler to lower its temperature to less than 7 Kelvin (minus 447 degrees Fahrenheit / minus 266 degrees Celsius).